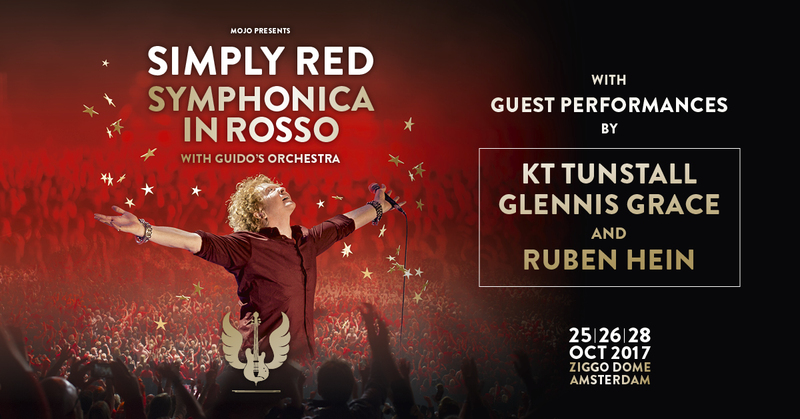 Special guests KT Tunstall, Glennis Grace and Ruben Hein have today been announced to join Simply Red at this incredible show taking place on 25, 26 and 28 October in Ziggo Dome in Amsterdam. More information about the event / ticket sales at www.symphonicainrosso.nl. We’re very excited to share this good news with you today. 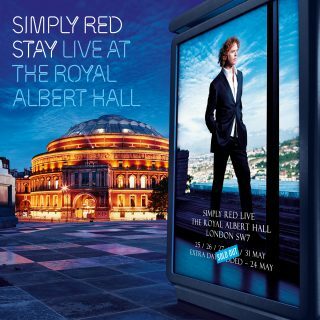 For the first time ever (unless you have bought the physical DVD), you are able to listen to ‘Stay’ as performed live during a six-night residency at London’s Royal Albert Hall in 2007. In addition to the full ‘Stay’ album, it also includes the hits ‘Fairground’, ‘Money’s Too Tight To Mention’ and ‘Stars’. 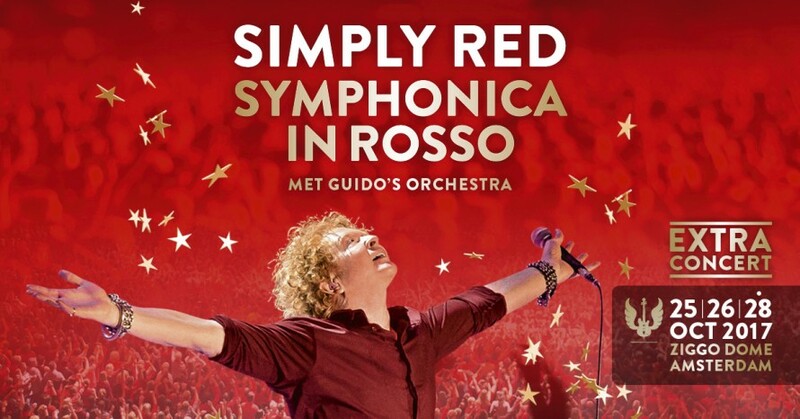 Simply Red have today announced a third date, October 28th 2017 for the annual Symphonica in Rosso music event. As promised, Mick will be bringing some of his best-loved songs to be accompanied by a 40-piece symphony orchestra and special guests. The spectacular red setting and famously good sound & lighting that the show employs promise to make this a truly memorable show. 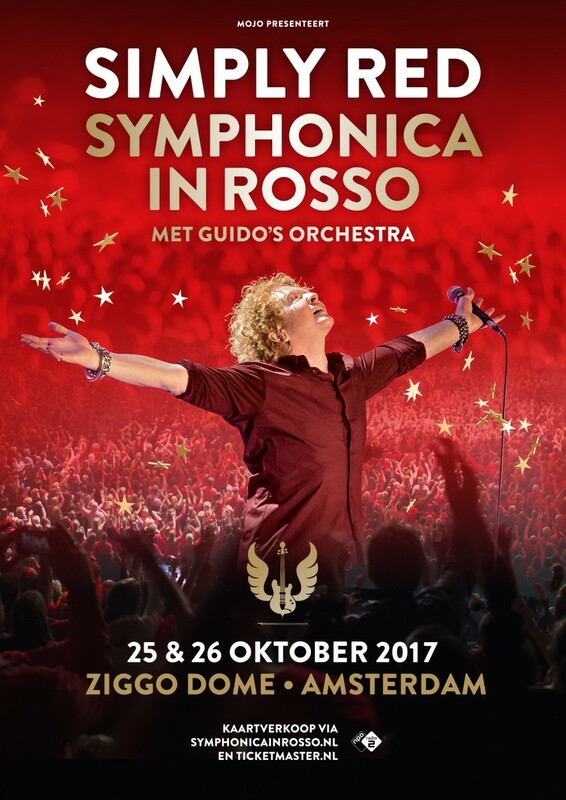 In case you missed the announcement last night, Simply Red will be headlining the annual Symphonica in Rosso music event in Holland in October 25th 2017 and we are excited to let you all know that an extra date has been added for October 26th. Mick will be bringing some of his best-loved songs to be accompanied by a 40-piece symphony orchestra and special guests. The spectacular red setting and famously good sound & lighting that the show employs promise to make this a truly memorable show. Today is the 25th Anniversary of the release of the Simply Red STARS album and to celebrate we’re giving away 10 copies of the new STARS vinyl (just released today), which will be signed personally for all the winners by Mick Hucknall! The competition will run on Facebook all day today – we are going to show you 10 videos and all you have to do is to find the hidden letter in each video (please note you won’t see the letters on your mobile, you need to watch them on a laptop or desktop). When you have all 10 letters you need to work out what they spell and send us the answer. Details of where to send your answers will be posted with the last video. So go to Facebook right now and watch the first video which is track 1 from Stars, Something Got Me Started and look out for the first letter. Good luck everyone! Posted in News | Comments Off on 25th Anniversary Competition!